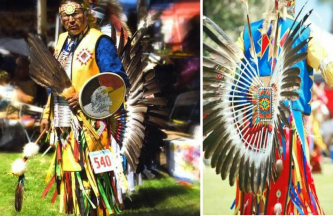 Missing items include bustle feathers, roach and feathers, trailer with feathers, breastplate, head band, arm bands, eaglehead dance staff, shield with painted eagle head, and eagle feathers hanging as well as a gourd rattle and a roach stick with two eagle feathers. Cadotte’s name tag is on a vest. The box may have been destroyed, so please also report any loose items matching these descriptions if you find them.